Popular Hamilton Island apartment! Sought after for its ground floor position, central location and the stunning renovations! Ideally located between the Resort and Harbour/Marina sides of the Island, this fully self contained apartment offers lovely views across Catseye Bay. Wifi access available – pay as you go device. It is in a central location, walking distance to Hamilton Island resort, the beach and front street where all the main restaurants and shops are. Poinciana 003 on Hamilton island is a great place to both relax and stay close to the action. The owners have spared no expense to make this apartment one of the best in the complex! Beautiful ground floor apartment with luxury furnishings and lovely water views. 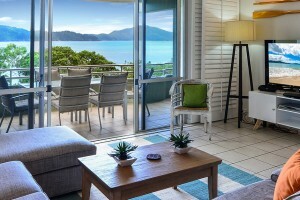 A great choice for your next Hamilton Island holiday. The kids will love the grassed area in front of the patio to play. Internet Pay as you go 4G internet device available. Login and purchase data. Stay at Poinciana 003 in May 2019 and receive a super special of 10% off (min 4 night booking) plus the 6th night free! Valid for new bookings from 1st April 2019. Popular for its central location and ground floor aspect! Ground floor apartment! Very popular for the large open tiled patio area before an open grassed frontage. The master bedroom also opens out to the patio, is spacious and has a Flat screen TV on the wall. There is an ensuite bathroom. The second bedroom can be made up as two singles or king bed. This bedroom also has a flat screen TV on the wall! There is a second bathroom. The pool at Poinciana is set in beautiful tranquil surroundings. At dusk the Wallabies even come up and nibble at the grass. There is also a stainless steel bbq for your enjoyment. There is a Plasma TV, DVD, and Austar TV all for your enjoyment. The kitchen has beautiful Caesar Stone benchtops and is fully equipped with everything you could possibly need. Including dishwasher, microwave and large fridge with icemaker. 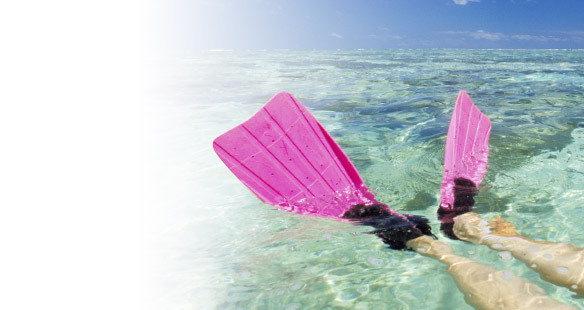 Champagne on arrival – a great start to your Hamilton Island holiday! All linen including Beach Towels are provided at Poinciana 003 on Hamilton Island. Valet return Hamilton Island Airport transfers. Look for the sign with your name on it! HI Stacey,Everything was fantastic. The golf cart was great! Apartment was very nice & comfortable. Really enjoyed the island & accommodation. Would happily recommend to people. Thank you.regards,Sean Trinder. Lagoon 102 - The Beach Shack!